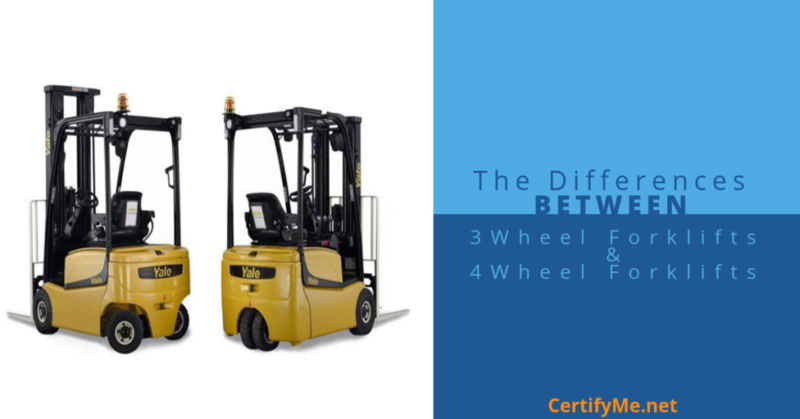 Our forklift certification experts are often asked about the main differences between these forklifts, so we figured a blog post on the subject was in order. CertifyMe.net offers complete OSHA training and certification for 3 wheel forklifts, 4 wheel forklifts and all other types of pallet jacks, man lifts, forklifts, and other powered industrial trucks. Check out our OSHA forklift training courses today, and sign up to get your company on the path to compliance today! Let’s take a look at the 3 wheel vs 4 wheel forklifts debate. The obvious difference between 3 wheel forklifts and 4 wheel forklifts is one wheel, but the design and operation of each lift is significantly different. For starters, 3 wheel forklifts have a much smaller turning radius than other types of lifts. As such, they’re ideal for small warehouses or anywhere else where space is at a premium. If your warehouse is typically crowded, with narrow aisles, a 3 wheel forklift is probably your best option for quicker load handling, cargo management, and overall efficiency. Most warehouse forklifts are the 4 wheel variety. The big advantage of 4 wheel forklifts over 3 wheel forklifts is their stability. While they take much more room to turn 180 degrees, they’re better suited for a variety of loading and unloading activities, and are also better when maneuvering on slightly inclined surfaces. Another difference between the lifts has to do with lifting capacity. Many 3 wheel lifts simply don’t have the wide base and extra structural integrity to lift as much as 4 wheel forklifts. As you can see, each type of lift has their own positives and negatives. Here’s a quick summary of 3 wheel forklifts vs 4 wheel forklifts. Sign up with CertifyMe.net Today for 3 Wheel Forklift Training, 4 Wheel Forklift Certification & More! From 3 wheels to 4 wheels to rough terrain forklifts and beyond, CertifyMe.net has the OSHA compliance training you need. Our instruction creates a safer workplace for all of your employees, and you can remain confident in the case of an OSHA audit or inspection. To eliminate your forklift fleet’s training gaps for all your powered industrial trucks (3 wheel forklifts, 4 wheel forklifts, etc. ), sign up with CertifyMe.net today. Our training courses help anyone achieve OSHA compliance in no time – for much less money than you think, too! If you have any questions about 3 wheel forklifts or 4 wheel forklifts, give our forklift training consultants a call today at 1-888-699-4800. CertifyMe.net will save you time, money and hassle – and most importantly, you’ll be OSHA compliant! We look forward to hearing from you soon.